For many medieval maps created by European cartographers, locations were represented not by their geographic size but sized based on their importance to Christianity. Angels and mystical creatures were drawn as being part of the Earthly world and God often occupied a primary place at the top of the maps. Maps at the time were oriented with East towards the top and Jerusalem, the most holy place in the Christian faith was placed directly in the middle of the maps. The T-O map represents an early and simplistic vision of the medieval world. 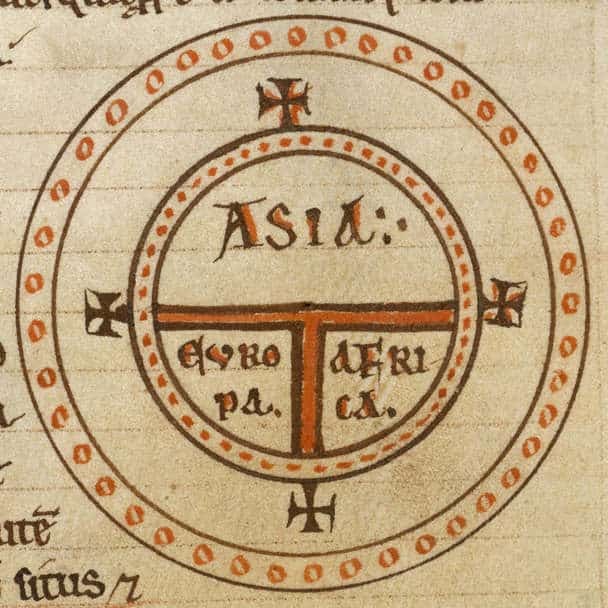 First drawn by St. Isidore of Seville around 600-625 in his work “Etymologiae”, the circular map shows the three known continents of Europe, Asia, and Africa. A ‘T” divides the continents with the Mediterranean, the Nile, and the Don rivers. East is at the top and the oceans flow around the continents, representing the “O”. Jerusalem is located in the Middle of the map. Most medieval people did not travel. Especially during the early Middle Ages, the sphere of their world was restricted to their immediate location (Main, 2017). Of those that did travel, taking a pilgrimage was the most popular reason. Pilgrimages were an important avenue by which the faithful could absolve their sins (British library, n.d.). Rome, Santiago de Compostela, and Jerusalem were the most popular destinations. These trips would take months and require elaborate planning (Medievalists.net, 2014). It’s not surprising that there are manuscripts written by travelers as guides for pilgrims. These guide books advised, among other things, about what to pack, who to bribe, what to wear, and where and how to sleep. Around 1250, Mathew Paris, a monk, chronicled events from the creation of the world to the mid 13th century in his work ‘Chronica Major’. At the beginning of this manuscript, he drew a map showing the pilgrimage route from London to Jerusalem. 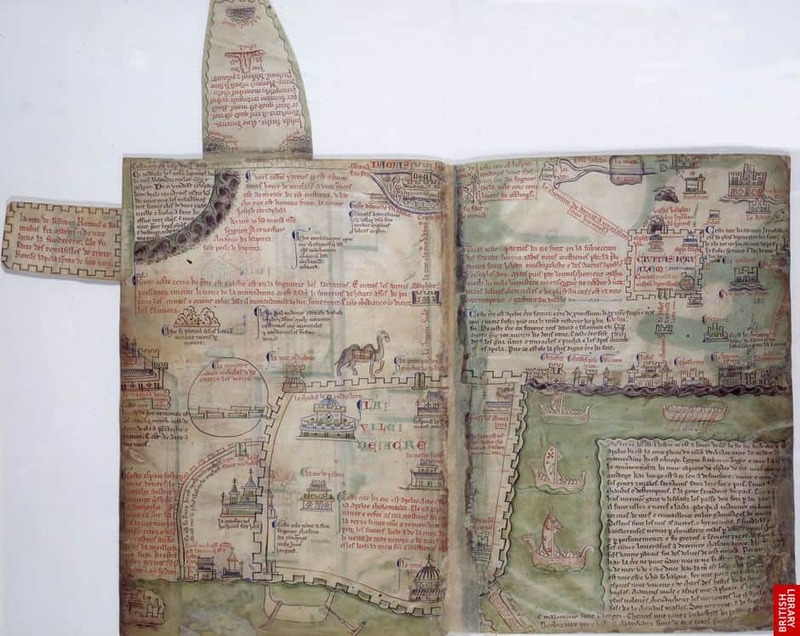 This medieval road map is spread over seven pages and takes the viewer on a journey from London through major stops on a pilgrimage to Rome and Jerusalem (Connolly, 1999). Santiago de Compostela in Spain is the location for the Shrine of St. James the Great, one of the 12 apostles of Jesus. The Way of St. James is a network of pilgrimage routes through France and Spain to this shrine. 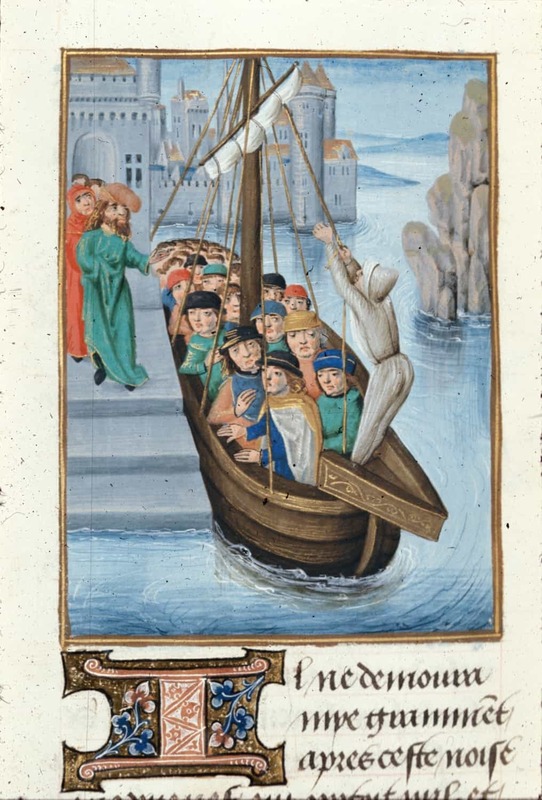 It is considered one of the only three pilgrimages where all one’s sins would be forgiven and was highly popular during the Middle Ages (British library, n.d.). 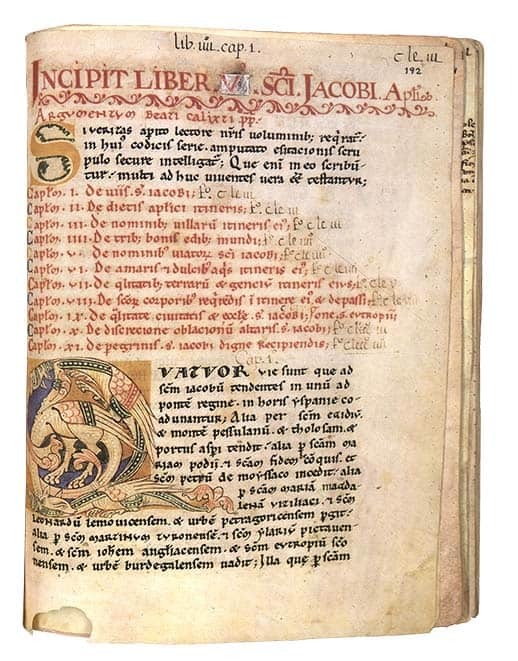 In 1170, a five-volume codex entitled “Liber Sancti Jacobi,” but also commonly referred to as the Codex Calixtinus, was produced. In addition to prayers, chants, liturgical and historical text, the fifth volume is a travel guide for pilgrims. Table of contents for Book V of the codex, the “Pilgrim’s Guide.” Facsimile, Southern Methodist University. 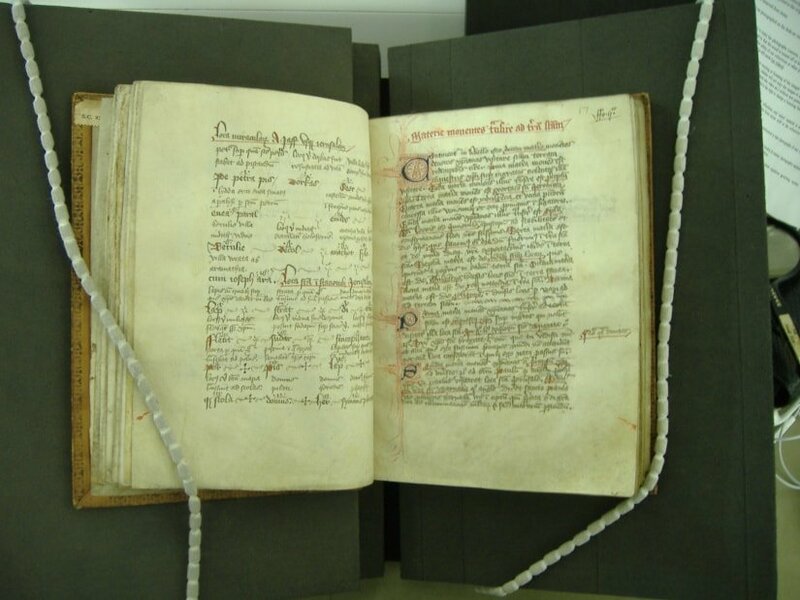 Original manuscript housed at Santiago de Compostela in Spain. William Wey (c.1407-76) was another traveler who wrote extensively of his journeys to Santiago de Compostela, Spain to the shrine of Saint James the Great, and to Jerusalem. He published his accounts including travel tips in Itineraries around 1470. Choose for yourself a place in the said galley on the highest deck, because below, in the lowest, it is right smouldering hot and stinking. If you are going to get a good place and be comfortable in the galley and be well looked after, you will have to pay forty ducats for your galley and for your meat and drink to the port of Jaffa and back to Venice. Mappa Mundis are maps of the world created during the Middle Ages. These maps were not intended to be geographically accurate. Rather they were designed help to explain the theological position of man in the natural and supernatural world. 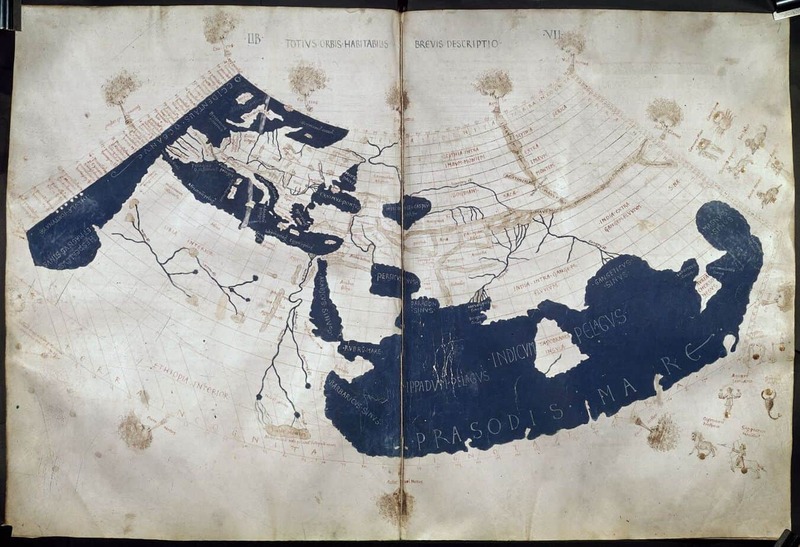 Mappa Mundi by Beatus of Liébana, based on the accounts given by Saint Isidore of Seville, Ptolemy and the Holy Bible, 8th century, Folios 45 verso and 46 recto from the Apocalypse of Saint Sever. 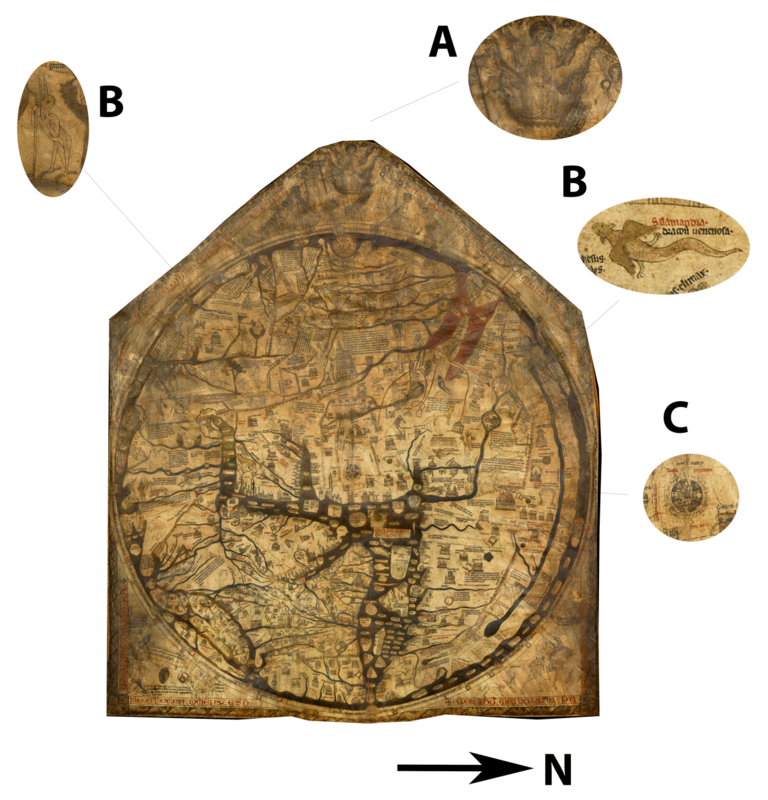 Created around 1300 CE, the Hereford Mappa Mundi is one such example. This maps shows the geographic extent of knowledge at the time. As was common at the time, East is at the top of the map. The three known continents, Asia (top of the map), Europe (left side of the map), and Africa (right side of the map) are drawn. Jerusalem (C), where Christ was crucified and rose again, takes the prominent place in the center of the map. Alongside depictions of places and towns, supernatural beings (B) are shown, and God and the angels (A) peer down from the heavens at the top of the map. 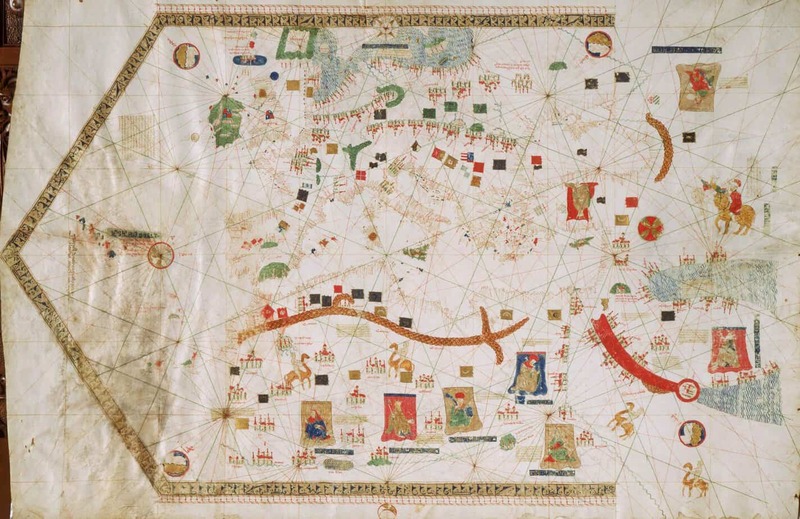 Portolan maps were medieval navigational charts of the harbors and trade routes of the Mediterranean. These charts originated during the early part of the 14th century from Spain and Italy (Campbell, 1987). Known for their accuracy, these charts provide an amazing source of place names for the Medieval period. Portolan chart by Gabriel Vallseca, 1439. Portolan maps were the first cartographic product to regularly display lines of latitiude and longitude and were the first category of medieval maps to adhere to a scale (Campbell, 1987). Portolan charts also characteristically contained rhumblines, lines of wind or compass direction which were used by sailors as they plotted their course from port to port. 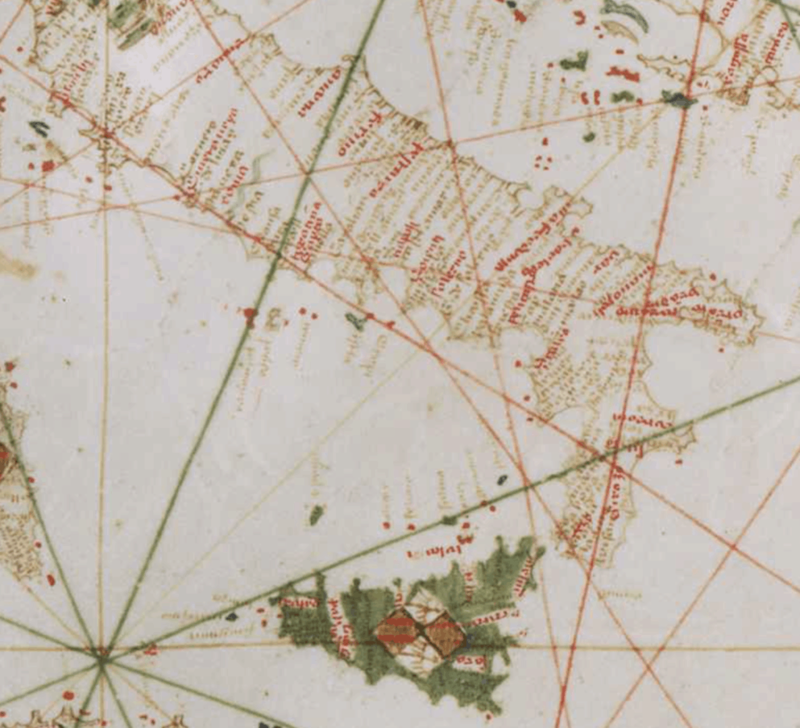 This close up of a portolan chart shows the outline of the coast of Italy. Overlayed are the grids of latitude and longitude (squares) and the diagonal lines are rhumb lines. The dark green lines represent the 8 primary winds, the red are the 8 half-winds, and the tan are the 16 quarter-winds. 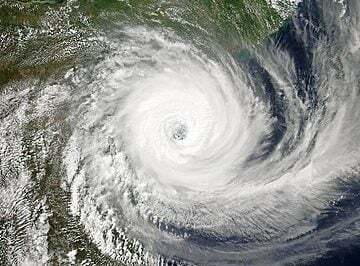 Ptolemy was a Greco-Roman geographer whose work Geographia, written about AD 150, described and compiled all of the knowledge about the world’s geography in the Roman Empire of the 2nd century. In the 15th century, his work was rediscovered and translated into Latin from the original Greek. Ptolemy influenced Medieval cartography though his use of applying coordinates of latitude and longitude to 8,000 geographic locations as well as the use of mathematical calculations to accurately depict geography. Ptolemy’s Geographica, translated by Emanuel Chrysoloras and Jacobus Angelus Harley 7182 ff. 58v-59, 3rd quarter of the 15th century, British Library.